Alain Reiher was born May 19, 1955 in Port-au-Prince Haiti, immigrating to Montreal, Canada with his family in 1965. At age 21 he began his musical studies with Stephen Fentok at the “Conservatoire du Québec à Montréal” from 1976 to 1981 and obtained a First prize diploma in classical guitar interpretation. He subsequently created the guitar accompaniment for two documentaries by Jacques Godbout of the National Film Board of Canada. He also worked with the Haitian poet Antony Phelps creating the segue music for his album of poems “Mon pays que voici”. Alain’s first composition “Préambule and Rhapsodie” was chosen among the ten top compositions to be published by Mel Bay in its Winner’s Circle 1994: The GFA Set Piece Competition. In January 2001, Alain was invited to Haiti as a guest artist to share a solo concert with 3 fellow Haitian guitarists for an evening of classical music as part of the festivities during the week of Diaspora. Upon his return, Alain recorded his first CD entitled “20 miniatures” with the help of a grant from the Canada Council for the Arts. In November 2014, Alain has published in Les Publication d’Oz a piece recorded by Hanh Nguyen on her Amor del Mundo album “La Milonga de Paludes”. 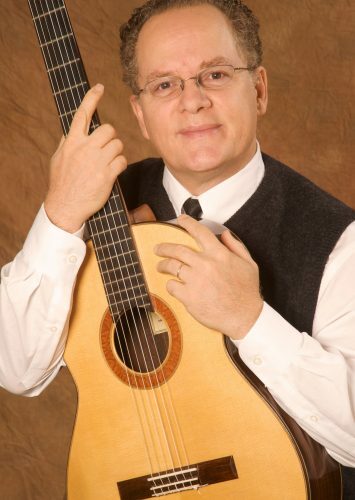 Alain has taught both children and adults privately and in group settings and continues to teach classical guitar at the Shadbolt Centre for the Arts in Burnaby where he has been employed since 1996.